Connacht arrived in Thomond Park this evening in confident mood. The western province had shone in their 44-16 thumping of Ulster and narrow 21-18 loss at the RDS coming into this clash but knew this would be a greater challenge than any – taking on a wounded Munster without the help of star men Ultan Dillane, Kieran Marmion or Bundee Aki. For Johann Van Graan and his men in red, this game was a golden opportunity to get the season back on track following post-Christmas blips against Ulster and Leinster. Facing Connacht has been no straightforward task in recent years, but one glance at the teamsheets would seem to be reason enough to expect a convincing win for the home side. Connacht would take the early initiative just minutes in as Jack Carty nailed a touchline penalty and Kieran Keane’s men would continue in such dominant vain for the opening fifteen minutes. Munster’s discipline issues proved problematic once more as referee David Wilkinson repeatedly penalised the home side, seeing an early period of favourable territory for the visitors. However, that eventually changed as Munster went through their plays, drilled a kick in behind and muscled Niyi Adeolokun into touch. An accurate lineout and some strong carries later and Munster mustered up an end result that saw lock Darren O’Shea pick a superb line and crash over for the game’s first try. A moment that seemed to have erased the previously existing nerves and set up the hosts for a tidy night at the office. Some scrappy play later and Munster stretched out into a 10-6 lead as Ian Keatley added another penalty before the half time whistle. It was far from a vintage first half and one that hardly inspired much confidence into supporters following the struggles of previous weeks but it was enough to set a platform for a much-improved second forty. Munster simply had more in the tank. After a first half of many phases and few kicks, Ian Keatley stepped up to the plate and directed play from the ten shirt. A further penalty from the thirty year old, followed by two key contributions in the lead up to tries by Andrew Conway and Keith Earls got Munster motoring again as they soon built a comfortable 25-6 lead come the hour mark. Earls was a player that was beginning to cause problems for the Connacht defence and he would be at the centre of a key moment on 63 minutes. Connacht second row Quinn Roux tip-tackled the winger dangerously, causing a few tempers to flare and forcing Wilkinson into showing a yellow card. Munster would capitalize immediately as from the resulting attack, Conor Murray identified a gap in the Connacht defence and sniped over from close range in typical. style. Bonus point in the bag. You would think that defences would be all over that trademark show-and-go from the two time British and Irish Lion by now, but like many others, Connacht had no answer to Murray’s physicality from a couple of yards out – not once, but twice. 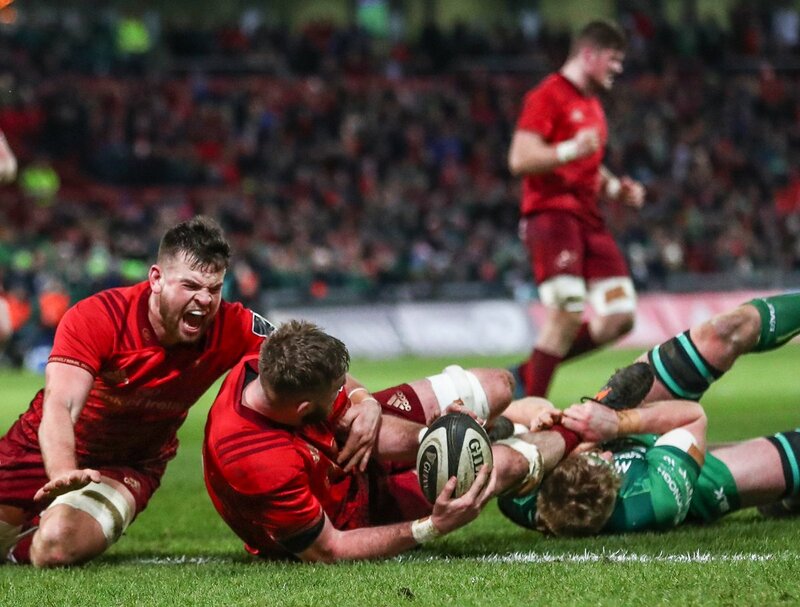 Come the seventieth minute, some crisp play by a Munster backline boosted by the introductions of Bill Johnston and Darren Sweetnam helped the team within firing range once more. The forwards rumbled on and for the second time in a matter of minutes, Murray found his way over, making it 39-6 following yet another conversion from Keatley. Connacht would bag a consolation through Tom McCartney in the dying moments but all in all Munster battled their way to what in the end was a comfortable victory, signing off this mixed interprovincial series on a positive note.